A fascinating look at the life and work of this amazing author and adventurer. Most everyone knows the name Jules Verne for several of his books (and later films), including Around the World in 80 Days, Journey to the Center of the Earth, and Twenty Thousand Leagues Under the Sea. Born in Nantes in 1828, Jules Verne and his wife Honorine lived in the house with the tower in Amiens for eight years, from 1882 - 1900, and he is buried in the Madeleine Cemetery in Amiens. His Amiens home is now a museum, fascinating to visit. You can visit on your own, and staff will provide written descriptions of the rooms in the language of your choice. In the English-speaking world Verne is often considered a writer of children's books, due to the translations and abridgements of his writing. In Europe he is considered a major literary figure, and in fact wrote many more books during his lifetime. He is certainly known world-wide, and is near the top of the list of most translated authors in the world. In addition, many people came to know of him through spectacular films such as Around the World in 80 Days, starring David Niven, Cantinflas, and Shirley MacLaine. This 1956 movie won five academy awards, including best film. Today, his home is a museum, which provides glimpses both into his life as a writer and explorer, as well as his personal life and family. The visit begins in the winter garden, a lovely sunny atrium. From there you will visit the more formal living room and dining room of the main floor, and then climb the spiral staircase to see where Jules Verne worked. 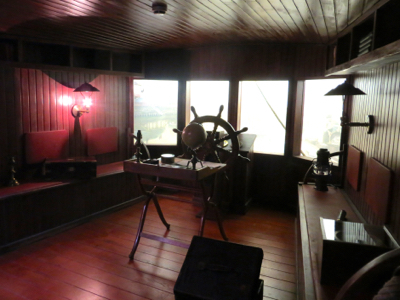 One space gives the sense of being a captain on a ship, setting off on great adventures. Other rooms contain many books, including large volumes used for research. You can also see the rooms where Pierre-Jules Hetzel, Verne's publisher, worked. Fun to picture Jules Verne and his imagination at work! If you're still up for another climb up a spiral staircase, you can visit the attic. Trunks of costumes and props, as well as colorful posters promoting the films based on his book allow you to get a sense of the public enthusiasm for the writing of Jules Verne. In fact, colorful posters may be found throughout the house. Jules Verne was a great fan of the circus, acrobatics, and fairground people. In fact, it was Verne who inaugurated the new Amiens Circus in 1889, replacing the older wooden one, saying, "It is, without a doubt, the most beautiful and the most comprehensive ever built in France or abroad, with all its fittings and equipment." Today it is known as the Cirque Jules Verne and offers circus training as well as performances. We were delighted to see the traditional circus roots represented in Amiens through Jules Verne. In addition, one of Verne's novels, César Cascabel (1890) bears the name of a Paris circus performer. The Maison Jules Verne is about a ten minute walk from the Amiens train station (map). Open every day from April through October, it has shortened hours the rest of the year, when it also is closed on Tuesdays Check their website to confirm opening hours. 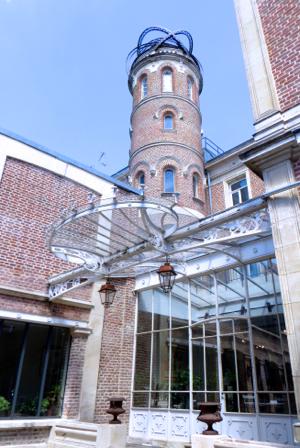 Above, The grand tower of Maison Jules Verne. On the lower level is the winter garden. 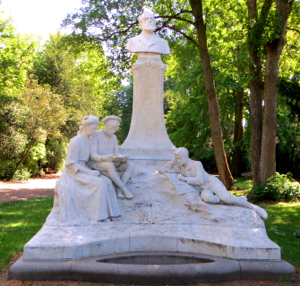 Below, Statue of Verne in a nearby park, with family members reading his books.